"I focus on whole foods and traditional ingredients. I use lots of vegetables and fruits and plenty of cream and butter! I choose seasonal, local ingredients because of the environmental impact and because that's the way things taste the best." 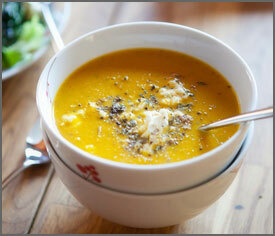 Humble carrots get reinvented into a Moroccan-inspired soup with orange, cumin, and ginger. Did you miss our last email?